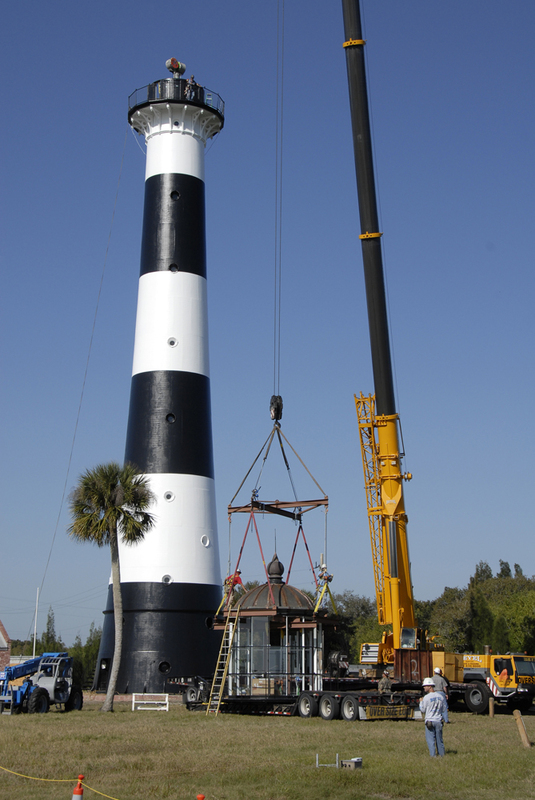 I have heard from The Cape Canaveral Lighthouse Association, the lantern room has been hoisted back atop the Cape Canveral Lighthouse. The relighting is set to be scheduled in about a month after final work is completed. Congratulations to the Cape Canaveral Lighthouse and the United States Air Force for fabulous work in this regard. This is a very unique and special tower at the Cape, and it deserves this kind of treatment. Here is a photo of the lantern at the bottom about to be hoisted up. George Diller, of the Florida Lighthouse Association, receives the photo credit on this remarkable image.